National Pet Day: Do You Look Like Your Pet? There’s nothing like the welcome home of a pair of adoring eyes in a furry face to vanquish the trials of the day. On National Pet Day (11th April), let’s thank our feathered, scaly, or furry bezzies for their unerring companionship. Here at Red Letter Days, we know the importance of pets. It’s evident in the sorts of things that their owners are willing to do to spoil them. Take a look at our Animal Adventure Days to see for yourself; we’ve got everything from pampering subscriptions to professional photo shoots. As part of this once-a-year occasion, our friends at PawPost let us into some facts about the buying habits of pet owners. Purveyors of nifty subscription boxes for cats and dogs, PawPost is an innovative way of making sure your creature feels like the cat that got the cream. Take a look at their Three Month PawPost Deluxe Cat or Dog Subscription and you’ll see what we mean. Interestingly, PawPost sells three times as many Dog Boxes as Cat Boxes on their website, but dog and cat owners spend the same amount of money on average. What’s more, “More people with small dogs buy our Boxes than those with larger breeds”, they told us. It made us wonder: perhaps we’re more likely to buy for dogs since they give us more obvious affection in return. The PFMA recently went round counting every tail, fin and whisker in UK homes (or something like that) and their report tells us that our country is home to some 54 million pets. That’s an amazing 44% of households with furry friends as part of the family. Cats and dogs are still the most common domestic animals, but which makes the best companion? 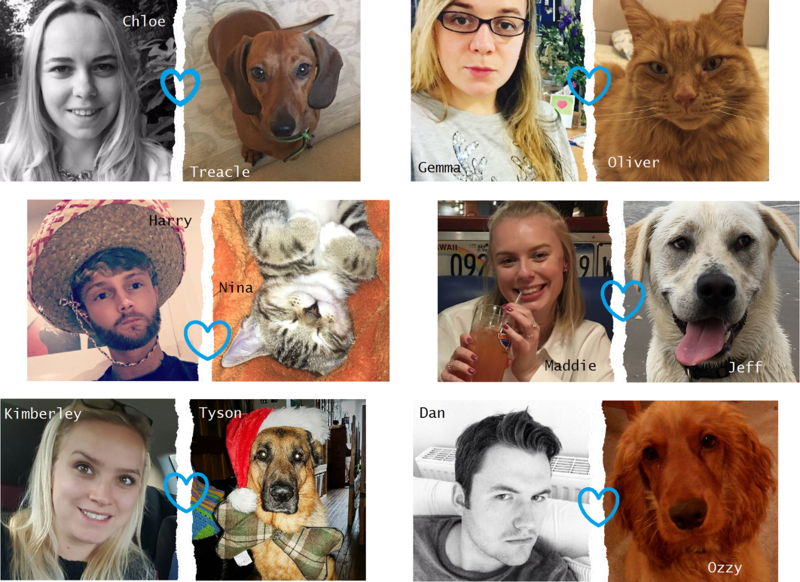 At Red Letter Days HQ, a quick poll showed that we’re a dog-loving bunch first and foremost. 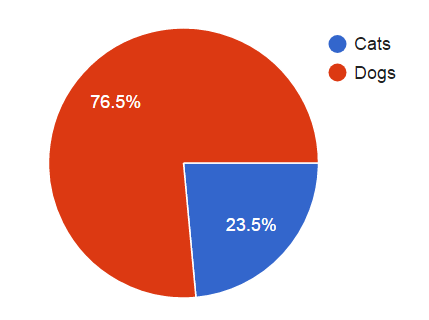 When asked “Which are better: cats or dogs?”, the majority answered “Dogs!”. As shown by the pie chart to the right, a staggering 76.5% of us were in favour of canines, compared to just 23.5% who loved cats most. Pet/Owner Resemblance: Fact or Myth? The crucial question playing on our minds today is: do pets look like their owners? Or is it one of those cutesy fables dreamed up by mad cat ladies? A study by Japanese psychologist Sadahiko Nakajima suggests that there really is some truth to the idea. For his test he recruited 20 dog and owner pairs and showed colour photographs of them to 502 students. One set of photos mixed up the pets and owners while the other set showed them in their true pairs. The students weren’t told which was which. The result? Nearly 3 quarters were able to discern the correct pairings showed pets and owners, believing them to look the most similar. Nakajima has concluded that it’s the eyes, above any other features, which are most likely to show similarities. We were intrigued by this study but not quite convinced. Can it really be the case that most owners and their pets share a resemblance so striking that strangers can perceive it? We decided to initiate a test using our own subjects. Below are some good-looking photos of Red Letter Days’ staff members and, on the other side, their equally handsome pets. They’ve all been muddled up. Can you match the pet with the owner? Feeling confident? Click below to find out how you did. Not finished gazing at cockle-warming animal photos? Take a look at our Festive Pets blog post, in which we ran a competition to find the best dressed pet. Images are courtesy of Red Letter Days’ staff and Unsplash.